It’s no wonder strawberries are on the top of our lists when we think of delicious, sweet fruits. However, sometimes we've noticed that strawberries might be losing their full-flavor, and it's because it's simply not the best season to be growing them. They may taste less sweet or less, well, strawberry-ish! 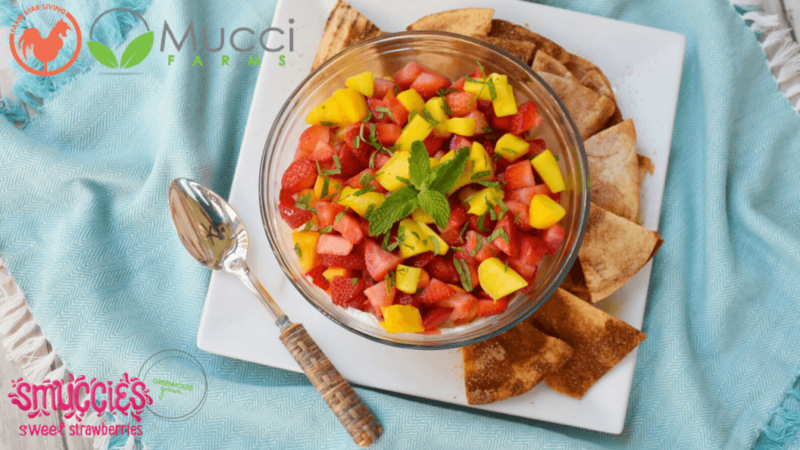 Not any more, however, as Mucci Farms® has started growing flavorful, delicious, sweet strawberries called Smuccies™ that are thankfully “always in season.” How is that possible? Because they're growing them in their state-of-the-art greenhouses! Let's look a bit more closely at who's behind these Mucci Farms. Tony and Gino Mucci came to Canada from Italy in 1961 – and with a dream already in mind. They rented farmland via a cropshare until they could purchase their own land in 1963. They began to gear themselves toward using greenhouses as their primary method of farming, and built their first “wooden frame poly greenhouse in 1969.” Over the years, the Mucci brothers cultivated a thriving family business built on quality foods. In 1994 and 2000, Mucci Pac and Mucci International Marketing were created to allow the family to have complete control of their packaging and shipments. Now, their children have joined the business and perpetuate the same mission and drive their parents had. Smuccies™ Sweet Strawberries have hit the market by storm, and since their deliciousness is undeniable, we are thrilled to be able to snack on them, cook with them, and know that we can have the same quality year-round. No guilt eating, too! Strawberries are only 49 calories a cup, they are great for weight loss and help fight anti-aging. They are the perfect addition to breakfast, as they are known to combat fatigue. Strawberries promote heart health and help protect your skin from harmful UV rays. So why greenhouses, you might ask? With their greenhouses, they can provide their plants with “perfect temperatures, humidity, and the optimal amount of water.” And growing strawberries is a meticulous process. It's not easy whatsoever. This way, however, they can control the environment and provide just the right care and supervision to grow delicious and juicy plants. Mucci Farms also uses a chemical free cleaning, using water as their cleaner and sanitizer. Then, all of their products are developed, processed and packaged in an equally controlled environment, then shipped to you via refrigerated delivery trucks! So, we love spotlighting this particular brand of strawberry, as we think it's a stand-out. And, boy, did we have fun making this recipe with it, too! Check it out and try it yourself. YUM!